I love the holidays. All of the holidays. So each year when Halloween rolls around it’s all about how I’m going to decorate my pumpkins. 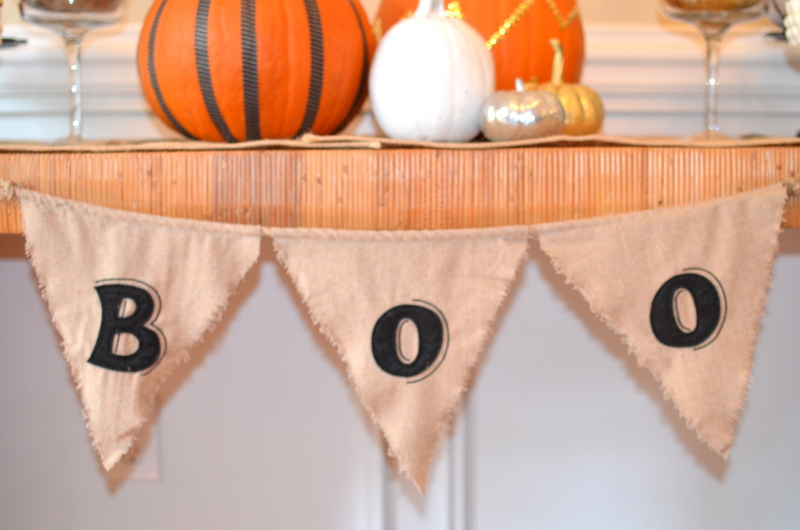 Last year I did a gorgeous monogrammed theme…I wish I could find the pics to share. Anyway, this year it’s all about the metallics. 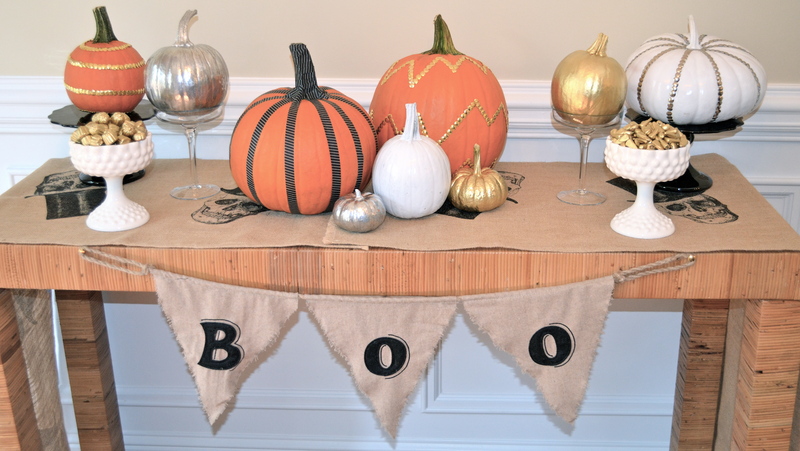 Obsessed with our hand made skull burlap runner, Noir cake plates, compotes, and glass treat stands. So let’s talk paint, spray paint that is. I love spray paint, and I especially love metallic spray paint. I used metallic silver, gold, and high gloss white. 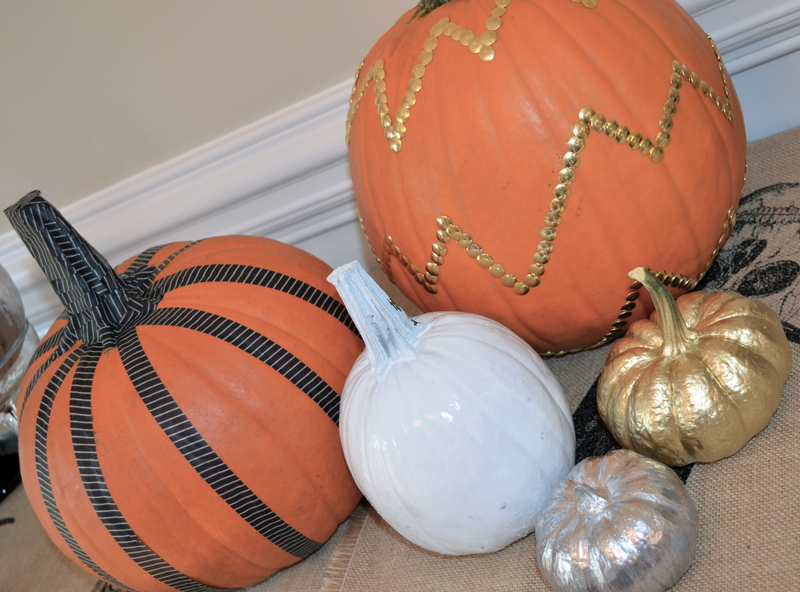 **TIP** just make sure your pumpkins are COMPLETELY dry before decorating…let the rest 24 hours. 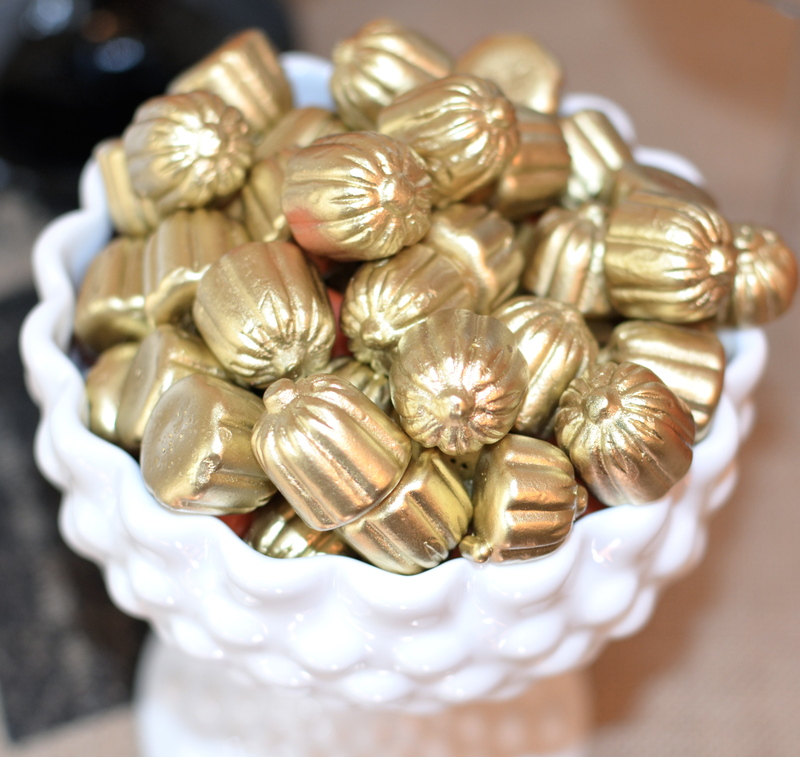 And pumpkins aren’t the only thing that look amazing spray painted as you can tell from our spray painted candy corn and mini candy pumpkins. Plus the spray paint helps me not eating a bag at a time! My love for Washi tape just grows and grows. You can do SO much with it, and it doesn’t ruin any surfaces so it’s perfect for crafting projects. 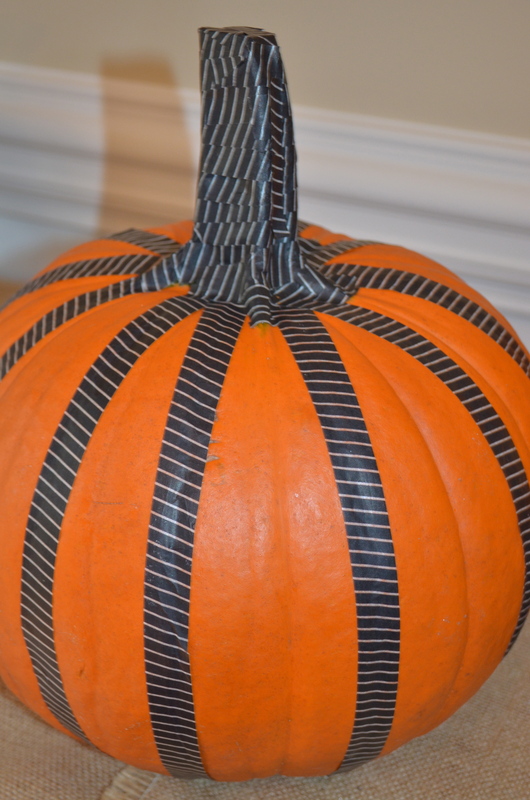 For my Washi pumpkin I used our black and white striped washi and simply ran it down the seams of the pumpkin. Then wrapped the entire stem as well. It only took 10 minutes and I only used about 1/4 of the Washi roll. If you haven’t tried Washi yet…it’s definitely a Martha MUST! 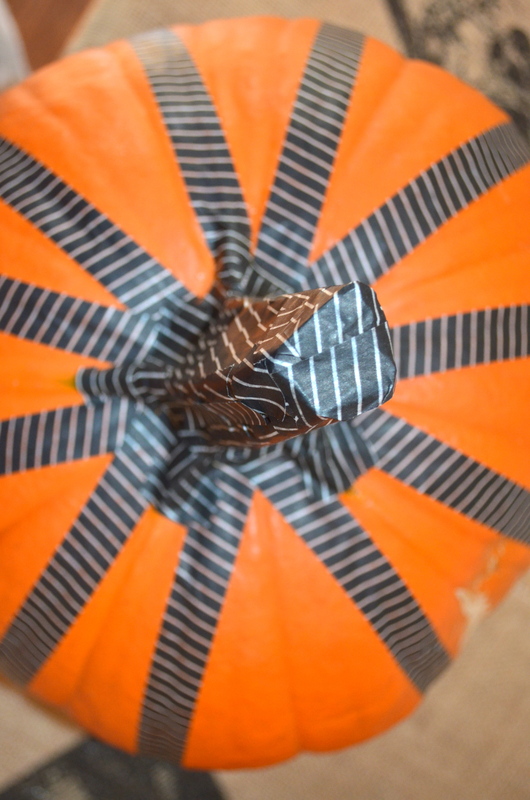 **TIP** Use the back of your scissors and run down each Washi strip to appropriately stick the tape on the pumpkin. Lastly we’re on to the thumb tacks. 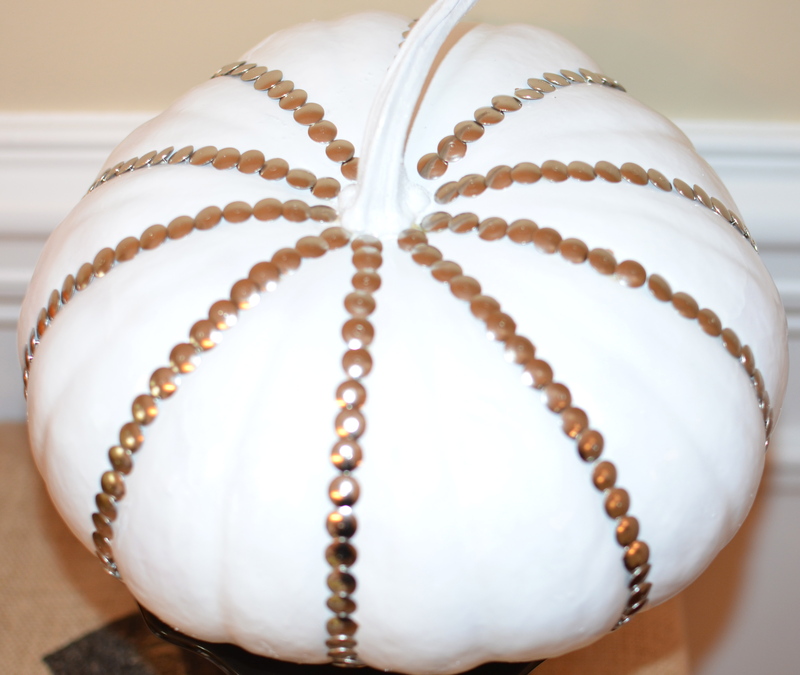 Not difficult, but the most timely DIY pumpkin project. 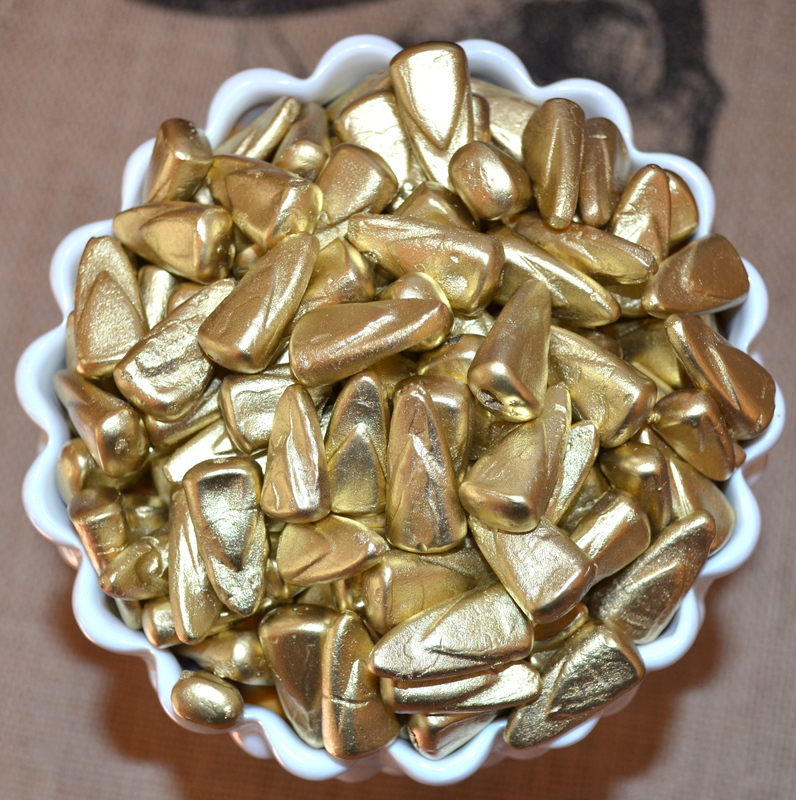 You’ll simply need about 500 or so silver and gold thumb tacks…I found mine at the dollar store. 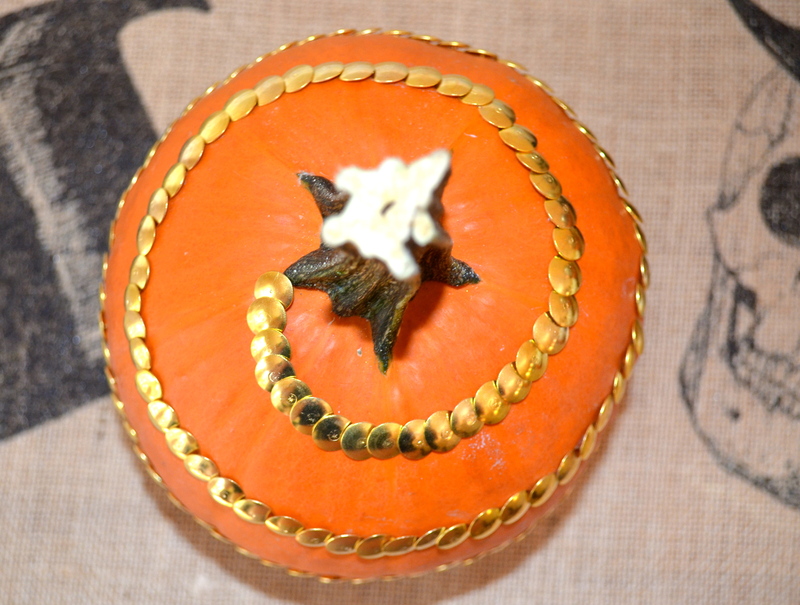 Then simply tack your favorite pattern on to the pumpkin. 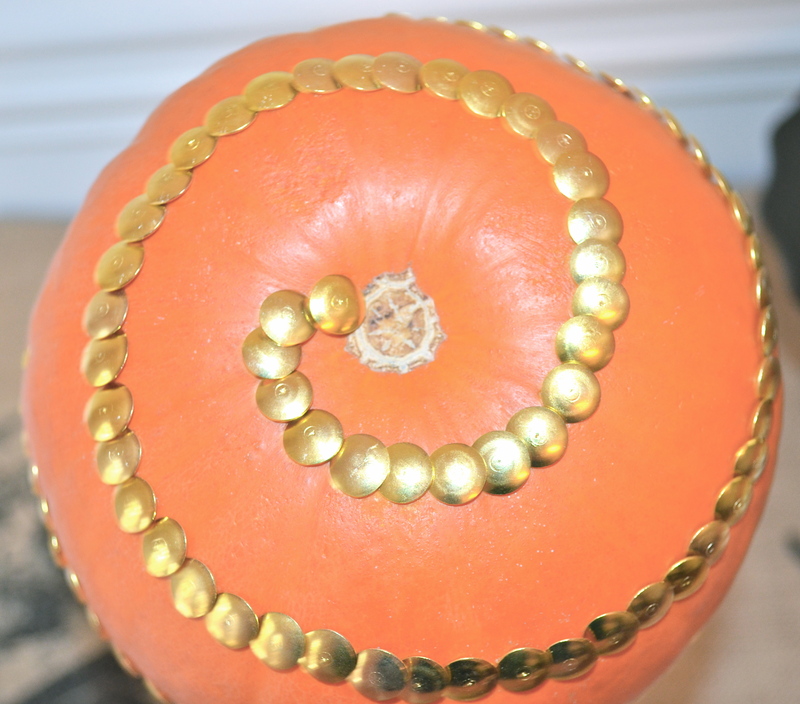 **TIP** Make sure you get smooth surfaced pumpkins and as symmetrical as possible. 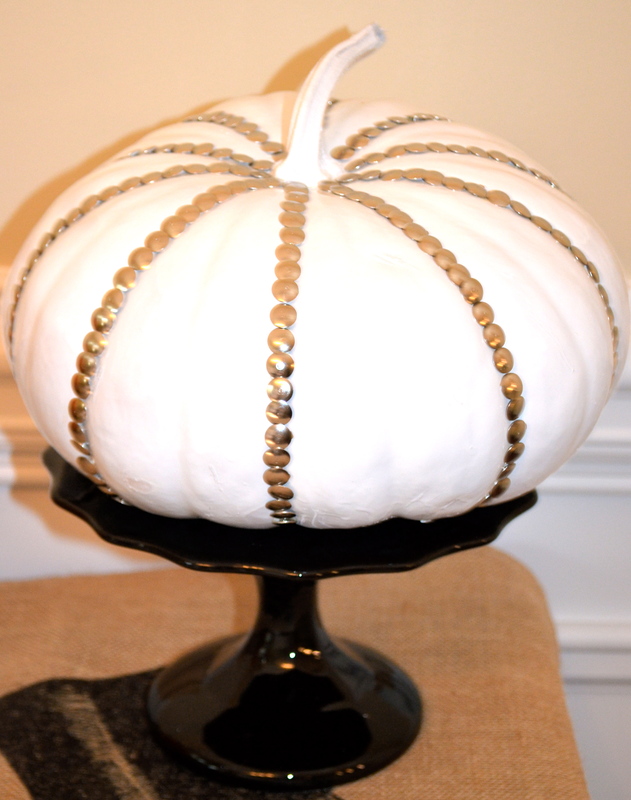 Out of the 3 thumb tacked pumpkins this one was the easiest because you can simply follow the seams of the pumpkin. And how fab does it look sitting on our Rosanna Noir Cake Stand? Make sure you slightly overlap each thumbtack and when tacking in the seams be careful not to push them in too deep because they can take off some of the spray paint. So everyone knows I love chevron. 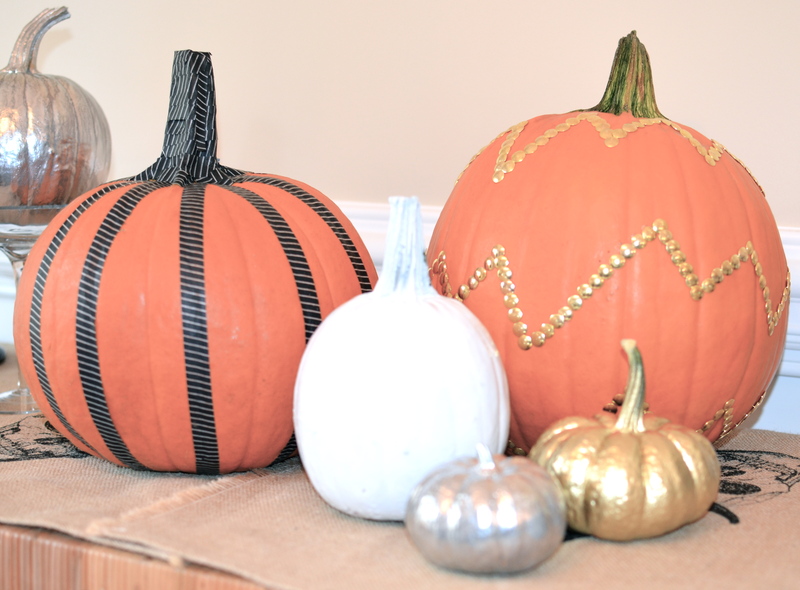 I first taped one of the pumpkins with blue tape in a chevron pattern and then spray painted it, but that was an epic fail. 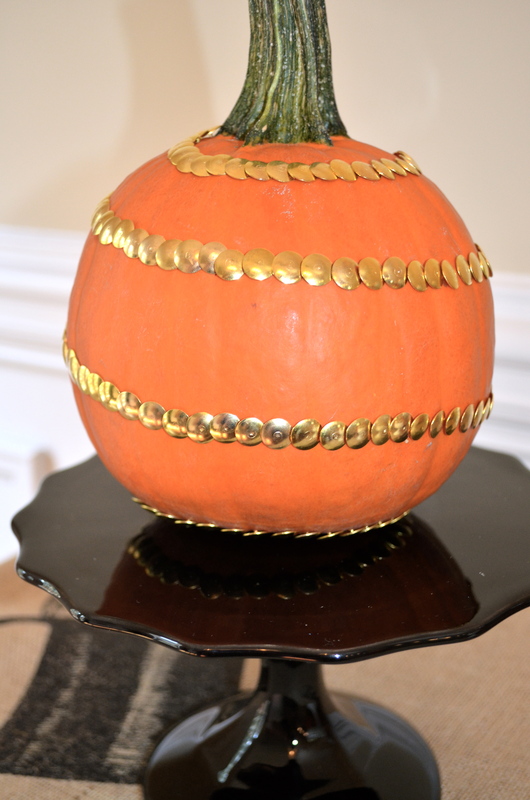 Because pumpkins are by no means flat so the spray paint seaps down under the tape and therefore no clean pattern. Since I didn’t feel like busting out the paint to try it a second time I thought I’d do it with thumbtacks. This was the most difficult one to do, but I didn’t stencil it out ahead of time which would have made it much easier and more symmetrical. However, perfection can be boring so winging it isn’t always a bad thing. Loved the swirl, it looks so amazing from the top and the bottom! 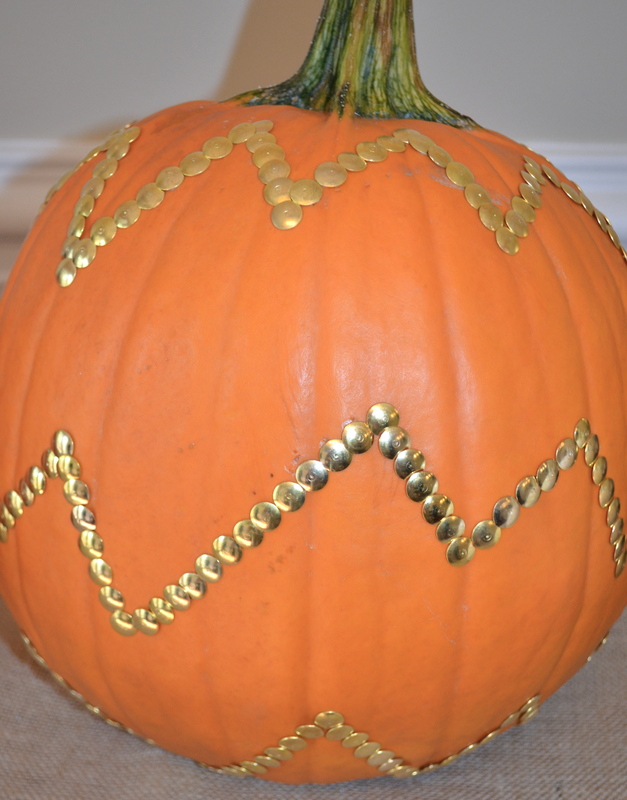 If you’re going to attempt this pattern my only suggestion would be to choose a medium or small pumpkin, if I would have done this on a larger one it would have taken forever! 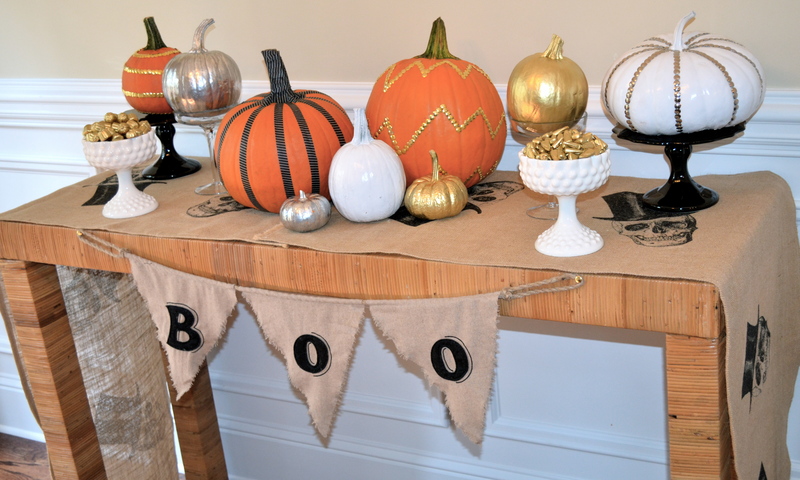 So in review all we needed was, pumpkins, spray paint, thumb tacks, and washi tape…of course the gorgeous table decor helped (shockingly you can find it all in our Boutique). 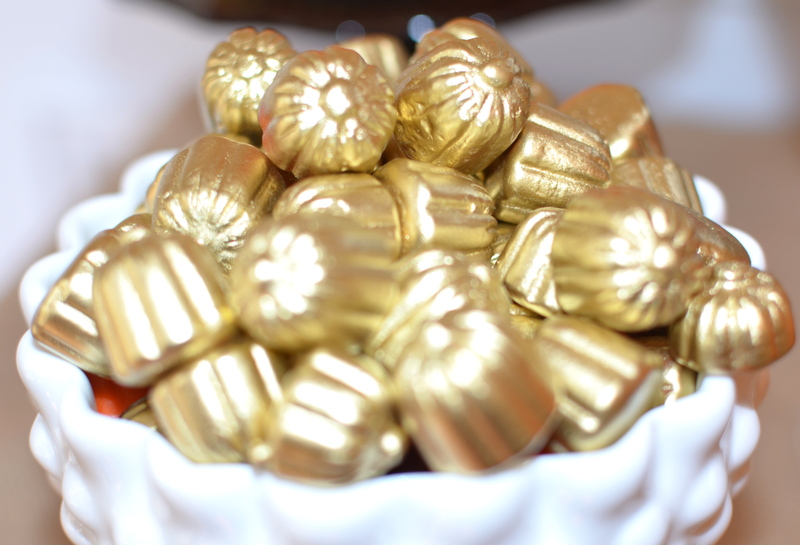 I hope these creations inspire you to make some un-traditional choices this holiday season! This is such a cute setup for Halloween. 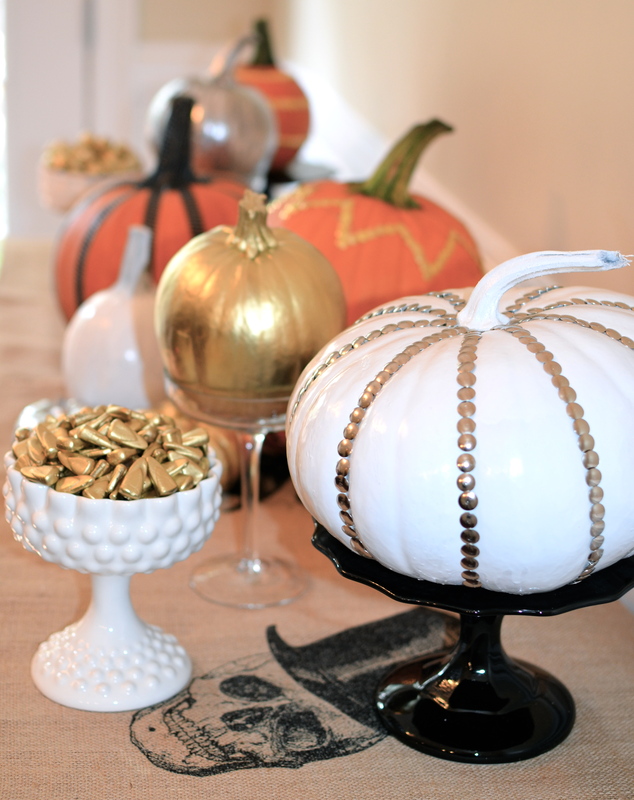 I especially love the gold candy corn and pumpkins!! I did a couple thumbtack pumpkins last year. You really have a great site! !